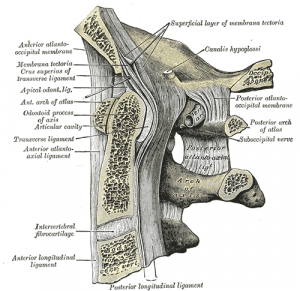 Strong broad structure which covers the Odontoid process and it's ligaments. Continuous with the Posterior longitudinal ligament and found on the internal surface of the vertebral canal. 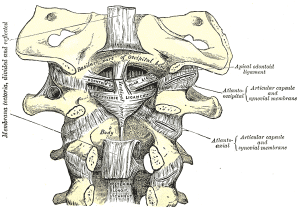 Arises from the posterior surface of the body of the Axis and, expanding as it ascends, is attached to the basilar groove of the occipital bone, in front of the foramen magnum. Its anterior surface is in relation with the Transverse ligament of the atlas and its posterior surface with the dura mater. As it enters the cranial cavity it becomes continuous with the dura mater. Contributes to the stability of the upper cervical spine. Limits Flexion (C0/C1 and C1/C2) and rotation (C0/C1). Histologically, parallel collagen fibers with spindle-shaped fibrocytes are observed within this membrane and near its attachment to the posterior axis, the collagen fibers are noted to be more homogenous with larger non-spindled fibrocytes. At the cranial attachment of the tectorial membrane, multiple calcified areas are noted that interdigitated with the underlying bone. Also near this cephalic bony attachment, there is an increase in the number of elastic fibers, which is found running parallel with the surrounding Type III collagen fibers. The tectorial membrane is found to be attached much more superiorly than previously described. the Tectorial membrane provides for a second line of defense, preventing the odontoid process from compressing the spinal cord and by doing so, secondarily limits movement of the craniocervical juncture. Flexion of the head makes the tectorial membrane fully taut at 15 degrees and extension makes it fully taut at 20 degrees; however, there occurs a buckling effect (redundant tectorial membrane) noted at the level of the odontoid process in extension. With the alar and transverse ligaments cut and with flexion of the head, the middle portion of this membrane stretched over the odontoid process, thus acting as a "hammock" that inhibited the odontoid process from moving posteriorly. The tectorial membrane does not limit cervical flexion per se but rather help to insure that the odontoid process does not impinge into the cervical canal. Lateral flexion is not found to be limited by this structure. Tectorial membrane injuries and REH are typically seen in young children who sustain a high-speed head and neck injury. The higher mobility of the pediatric craniocervical junction compared with that in adult patients is believed to facilitate craniocervical junction injuries. The radiologist should be aware of these kinds of injuries in the pediatric population. CT and MR imaging studies should always include this region when the mechanism of trauma is suggestive of craniocervical junction injury. Sagittal soft-tissue and bone algorithm reconstructions are helpful to identify these lesions on CT studies. MR imaging is more sensitive than CT and allows thorough evaluation of craniocervical junction ligaments in better detail. Clinical symptoms may be minimal or misleading. Distraction tests. With the head and neck in neutral position, the clinician gently distracts the head. If this is symptom-free then the test is repeated with the head flexed on the neck. Reproduction of symptoms suggests upper cervical ligamentous instability,particularly implicating the tectorial membrane.